Sometimes, harsh conditions call for a little extra power. In the world of self-propelled scrapers, push loading with a crawler is a way of life. While John Deere pull-type scrapers can direct load in almost any condition, the ability to push load has been built into the design of the ejector line to give earthmovers the additional versatility to which they are accustomed. Rock, hard pan, or heavy gumbos are just a few of the conditions where a crawler assist can keep the dirt moving. Push loading is approved in single, tandem, and triple ejector trains where a rear scraper extended rear bumper is employed. 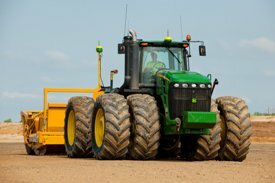 The 2010D E and 2412D E two-tire models feature an integrated push block standard. The iGrade controller enables and automates new water management applications, as well as John Deere's existing water management tool, Surface Water Pro™ Plus system. iGrade offers the ability to generate a basic plane and grade, as well as perform distance-based tasks – all while automatically controlling the height of the scraper blade. NOTE: iGrade requires the receiver to have an real-time kinetic (RTK) signal level. iGrade does not support wide-area augmentation system (WAAS), SF1, or SF2 signal levels. In both large- and small-scale jobs for commercial and residential applications, John Deere scraper systems shine. From 41.3 m³ to 13.8 m³ (54 cu yd to 18 cu yd), with the pull of a pin, John Deere scrapers make it versatile enough for contractors who work in a broad range of job types. John Deere scrapers are a valuable part of any construction fleet, whether as the primary mover or a complement to other equipment. Scrapers excavate, carry, spread, and grade material, making it the most efficient and versatile machine on any job site. John Deere scraper systems are not just for precision laser land leveling. 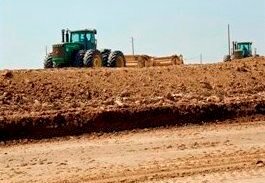 A sophisticated suite of precision agriculture products are offered, including iGrade for land leveling and Surface Water Pro™ Plus system for ditching and levee building. 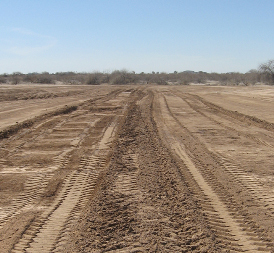 The scrapers are also perfect for cattle feed lot maintenance, grain bin foundations, waterway topsoil reclamation, commercial ponds, and much more. 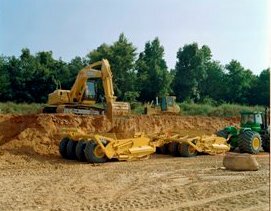 Anywhere material needs to be moved, John Deere scrapers provide a solution that can excavate, carry, and grade material with one operator, one implement, and one tractor. This gives the grower or contractor a level of efficiency that cannot be achieved with most traditional construction equipment. Just as contractors have adopted scrapers for their exemplary cost and productivity, miners look for greater efficiency when moving dirt or mined material. Scrapers are an excellent way to strip and reclaim overburden in pit mines or to simply haul stockpiled mined material such as coal. John Deere scrapers are built to handle the most unique materials – nimble enough to handle light materials like coal yet rugged enough for heavier materials like wet sea salt. 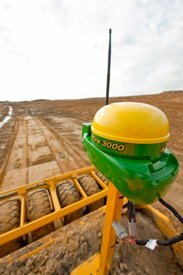 John Deere scraper systems are perfect for building and covering landfill cells in waste management applications. Waste management companies have experienced tremendous savings by trading in their trucks and excavators for the John Deere scraper system. Scrapers not only do a great job of creating a cell, but their ability to spread material on grade make it ideal for covering waste. The gang of tires compact the material as it is unloaded and will not destroy haul roads. 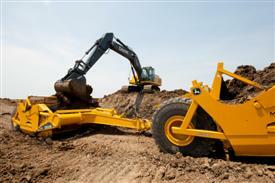 The scraper’s heavy-duty, rock-lug tires can handle the hazardous conditions found in a landfill. When heavy-garbage trucks deteriorate the offloading ramp, use the scraper blade to grade and rebuild it. Throughout the world, contractors have been moving material with conventional self-propelled scrapers or rigid/articulated trucks and excavators. John Deere scraper tractors and scrapers are a valuable solution for contractors, allowing them to move the same material using 1/2 the labor, 1/3 the investment, and saving 30 cents per cu yd to 50 cents per cu yd. 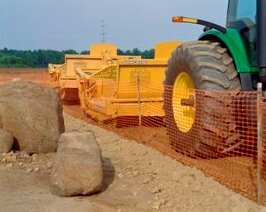 The John Deere scraper system is an independent earthmoving system requiring one operator to load, transport, and spread the materials on a job site. Self-propelled and truck/excavator earthmoving systems need additional support equipment to assist with loading and spreading the materials, increasing labor requirements. 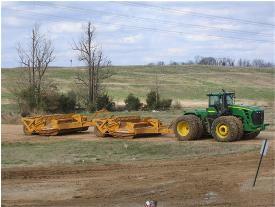 Compare the purchase price of a John Deere scraper tractor and scrapers to competitive systems. Factor in the labor costs, fuel burn, daily operating expenses of all the equipment used in the system, and it all adds up to 1/3 the savings over the life of the equipment. The savings are already adding up with the reduced labor requirements and lower investment costs. Experience additional savings from reduced fuel consumption by having only one tractor engine performing all of the work. Now increase productivity moving more yards per cycle when using our 18-cu yd or 21-cu yd scrapers in tandem or triple configurations. 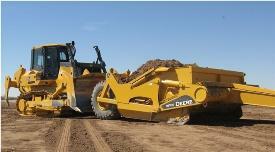 John Deere scrapers are designed to handle the harsh conditions of top-loading scrapers. A wide, unobstructed bowl opening and heavily shielded hydraulic lines, cylinders, and components provide a nice target for large excavator buckets. 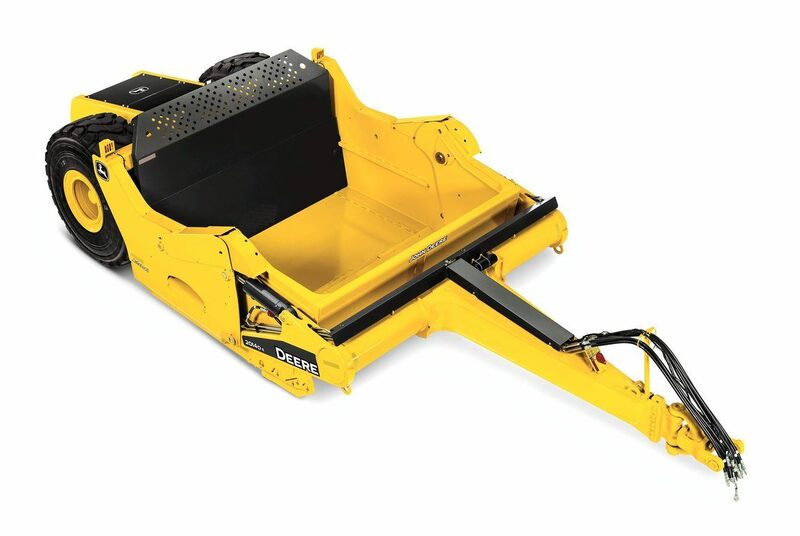 When conditions do not allow for direct loading, John Deere scraper systems can provide as much as 80 tons per cycle in top loading capacity with triples. Top-loading produces a force caused by the weight of the material falling into the scraper. With the scraper sitting on the ground, this force travels into the ground through the frame of the scraper. If the scraper is in the raised position, the force could cause extreme hydraulic pressure spikes, which can severely damage the hydraulic system of the scraper tractor and scraper. During top loading procedure, make sure the scraper blade is lowered and resting on the ground. Top-loading scrapers in the raised position could void the scraper warranty. An innovation in the earthmoving industry exclusive to John Deere, the AutoLoad feature allows novice and experienced operators alike to be consistently productive while operating John Deere tractors and scrapers with the touch of a button, even if they have never operated tractors and scrapers.